For thousands of years, humans have been dependent on plants for food, medicine and materials to sustain our population. From the ancient Hawaiians and their Taro cultivation, to the Mayans and their dependence on corn, civilizations learned to work with nature instead of against it, as it seems humans are doing now. 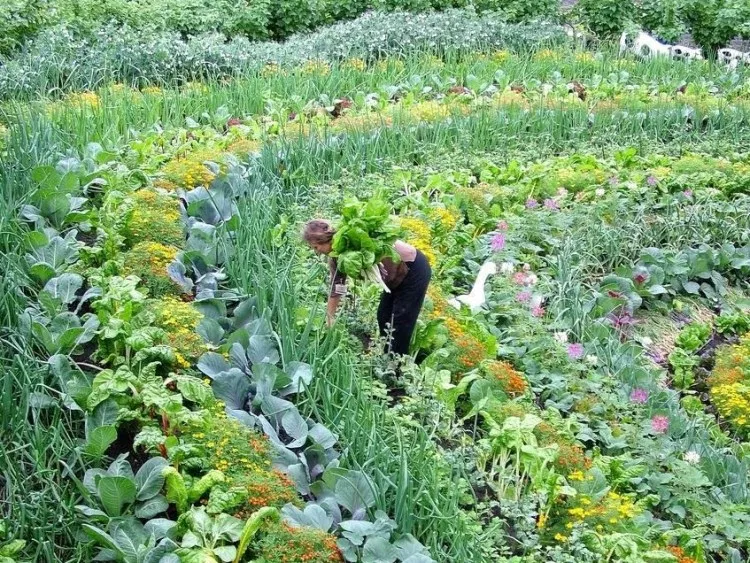 Instead of monocropping, pumping fertilizers and creating artificial soil that does not support natural cycling, ancient civilizations rotated crops every season, recycled unused organic matter, and farmed by hand to ensure they were loving the land. At my high school in Hillsboro, Oregon, our community garden is a large part of our science curriculum and volunteer work. Our garden leads the way in the model of having a fresh organic garden at public high schools in the area. Two things I’ve noticed, however, is our use of purchased, bagged fertilizers, and our monocropped plots. While these fertilizers are considered organic, they are still an unnatural, unsustainable way to farm, and only growing one species of plant causes rapid depletion of soil nutrients. During my time with Hawaii Outdoors Institute, I’ve learned many alternative ways to assist plants in their growth and production. The two methods of sustainable farming used in Hawaii that interested and inspired me the most were the agroforestry-permaculture model, and Korean Natural Farming techniques, specifically the use of Indigenous Microorganisms. Throughout the island, I saw gardens and properties brought to life when these techniques were used. 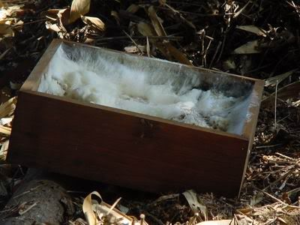 Both these techniques optimise the natural processes of an untouched forest; agroforestry uses space incredibly efficiently, and the amplification of microorganisms that are already found in the soil eliminates the need of store bought fertilizers. While these fertilizers aren’t all bad, they can leech into nearby streams, overload the soil with too much nitrogen, and these fertilizers can be unhealthy for the plants that use the soil. To efficiently teach others about and employ these gardening strategies, I plan to use my school garden and environmental scie nce class as a teaching resource for others. By formulating a plan with my environmental science teacher to incorporate agroforestry and Korean Natural Farming techniques in junior and senior classes for one period during the sustainable agriculture unit, this knowledge will be efficiently taught to lots of students. When these methods are used in the garden, people will see firsthand the effects of natural, sustainable farming, such as I did in Hawaii at HIP Agriculture. Using the direction found in the book Cho’s Global: Natural Farming by Rohini Reddy, I plan on teaching students how to gather, cultivate, store, expand, and use indigenous microorganisms. These microorganisms are native to their specific environments, and they’re found in virtually all soil. Adding cultivated IMOs to any soil in a garden is incredibly beneficial to plant health. IMOs benefit plant growth tremendously by fixing nitrogen in the soil for the plants to use, detoxifying chemicals that affect plant growth, and decomposing organic matter for plants to absorb. The work to cultivate these helpful friends is minimal, and their benefits are more than worth it! 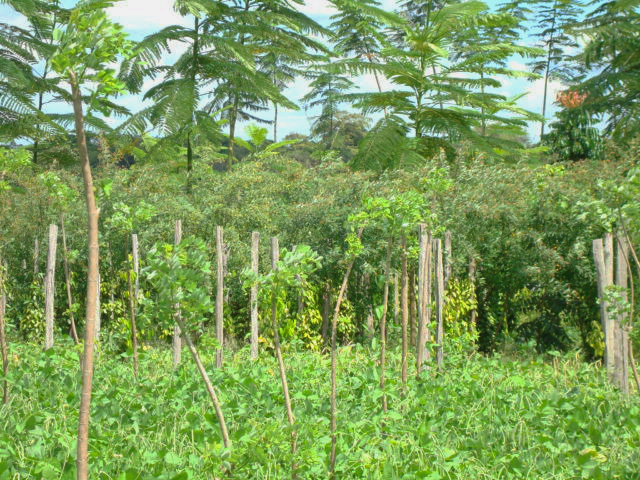 Another sustainable farming method I plan to teach my peers and use in my school is agroforestry-permaculture. This method optimizes garden space by creating “levels” in the space. For example, to maximize the efficiency of a garden plot, one would grow apple trees as an upper level crop, then berry bushes as a middle level crop, and cucumber vines as a base layer crop. This model ensures that different nutrients are being used, and the decaying matter of one crop benefits all of the rest. If this strategy was implemented in my school garden, its produce yield would increase dramatically. 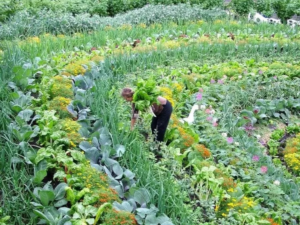 By combining the IMOs with agroforestry-permaculture, the overall health, produce production, and sustainability of any garden will drastically increase. Below: An example of agro-forestry in Brazil. Using the methods that ancient civilizations used and natural processes to benefit our gardens and crops is important, because in a world where our resources are quickly being drained by unsustainable practices, organic, natural farming must gain leverage if we want to continue to have fresh produce. Farmers had been honing their natural methods for thousands of years before chemicals and monocropping, and it’s time we continued to perfect and use their strategies to improve the health of our gardens.